Plumbing is a highly competitive business, and anyone in the industry knows that finding a consistent source of incoming clients is integral to success. With the marketing landscape changing at a rapid speed, it’s hard to exist just on word of mouth anymore. Smart and successful plumbing professionals know, that digital marketing, when properly leveraged, can provide a steady source of incoming leads that can be the key to your plumbing business’s success. It’s hard to ignore the power of the internet these days, and your website makes a huge impression on your clients. In fact, you could be losing you more business than you realize. To convert website visitors into clients, you need a website that instills trust, grabs interest, and loads fast. If it’s been a few years since your website has been overhauled, or if you don’t have one at all, developing a website that has strong conversion potential, is the first step for a successful internet marketing strategy. 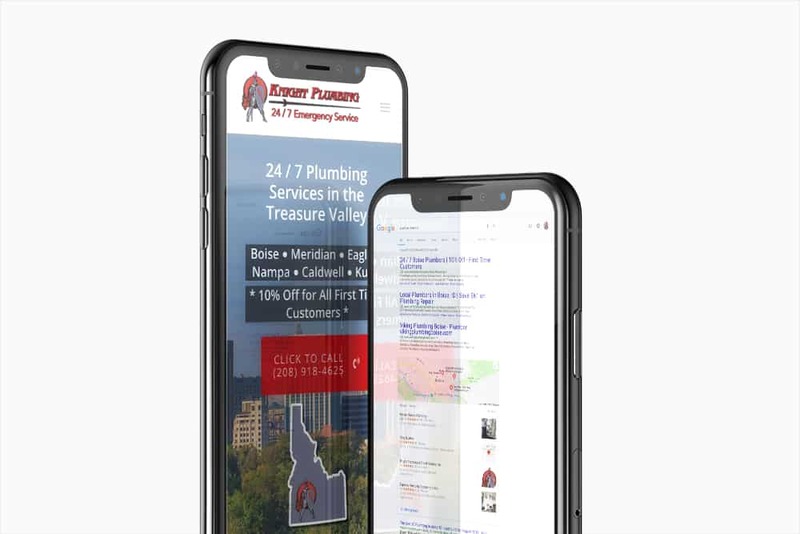 If someone needs a plumber, especially if it is an emergency, there is a likely chance they will go straight to their nearest computer or cell phone and search for help. This is what makes search engine optimization so important. Search engine optimization, or SEO, is the process by which a website is set up to appear on Google and other search engines. Specifically, for the plumbing business, local SEO becomes even more important as a way to stand out among your competitors. A pay per click campaign allows you to place your business even higher in the search engine results with the help of paid, sponsored placement. PPC campaigns are not only effective, but they can be turned on and off as you get busy, or as you slow down. Being able to control the ad delivery helps you keep your business running efficiently, while keep your marketing budget as low as possible. With both SEO and PPC, you get the added benefit of point of sale marketing, you reach your clients when they are thinking about needing your services, which produces a highly effective conversion rate. Email lists can be an effective way to communicate with your current clients and keep them as part of your loyal clientele. They allow you to remind your clients of services the may need or give them an offer that could entice them into an upgrade or needed repair. In addition, it can help you stay front of mind for referrals and reviews that can help grow your potential client base. Social media allows you to target your customers in a highly specific way. While most traditional media is geographically based, social media allows you to target to specific people based on interests or demographics. For instance, you can target homeowners specifically, as well as those who have recently moved. You can also use geographical targeting to hone in on older neighborhoods that may be likely candidates for repair or replacement. Reviews are necessary these days, especially in a digital world. With so much business coming from the internet, it is only logically that people seek out reviews to clear up the anonymity that can sometimes accompany the digital world. Reviews instill trust and help drive more customers your way. In addition, reviews are also important from a search engine optimization standpoint and can help improve your rankings. By using specific digital marketing strategies, you can retarget your website visitors to keep you and your business front of mind. Once people have visited your site, or searched for your services, you can employ remarketing tactics. Everyone has experience remarketing before. You look for something online and next think you know, you see advertisements all over the place. Plumbers can also employ this tactic which helps keep your business in their mind for those looking for non-emergency services. Even with the onset of the internet, referrals are still one of the most powerful ways to grow your business. So why not spend more time cultivating them? You can always ask current clients for referrals and you should. Client referrals are a powerful source, however setting up business relationships for referrals can take it to the next level. Consider joining some networking groups or find a builder you can partner with. Business relationships can provide a more productive and frequent lead source and can help your business explode. Online forums and social media are becoming an increasingly popular way to garner new business leads. For instance, on FB people are often looking for “Recommendations” for services. By growing your following you can open yourself up for more opportunities for recommendations. Join online neighborhood forums as well as social media groups and keep your eye out for opportunities to promote your business in a social way. Videos are a great way to communicate with your future client base. Videos, and sometimes just local and personal imagery, sends a message that personalizes you with your potential client. Rather than just being a name on a truck or a website, they can see your face –which makes it easier for them to trust you and your company. Marketing your business on a digital landscape can provide some challenges, but the potential it has to grow your business is hard to ignore. With a few strategic methods you too can help your plumbing business not just succeed but thrive. Need help taking your internet marketing to the next level? Call Social Eyes Marketing at 208-955-6679 and get started today. To have a successful plumbing business, you need a solid plumbing marketing strategy. Social Eyes Marketing specializes in plumbing website design, branding design, social media management, and search engine optimization. Whether you need a logo design, some social media help, or a brand new website we can help. Call us at 208-955-6679 today!